Calls To Investigate Clinton Pose A Challenge To U.S. Political Norms President Trump and some GOP lawmakers want an investigation into Hillary Clinton and other figures from the Obama era. But a probe of a defeated candidate is not the norm in American democracy. The president has revived campaign demands that Hillary Clinton be investigated, and some Republican legislators are joining in. 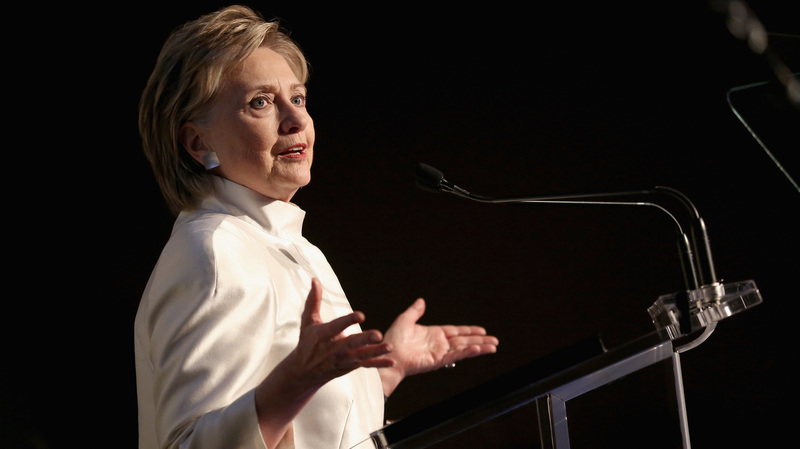 Washington University law professor Kathleen Clark, who focuses on legal and governmental ethics, says these calls for an investigation of Clinton — long after her political defeat — fall far outside American political norms. Traditionally, losing candidates are left alone after the election. With this effort to pursue Clinton, "I'd say that the norms are under significant pressure," Clark said. The demands to investigate go back to the heat of the 2016 race, when GOP candidate Donald Trump routinely referred to his Democratic rival as "crooked Hillary." On the campaign trail, he made a prediction: "She's likely to be under investigation for criminality for a very, very long time to come." After Trump won, he told The New York Times that he didn't want to hurt the Clintons. But as the weeks and months went by, more and more questions were raised about the Trump campaign's possible connections to Russian operatives and oligarchs. As Mueller's investigation of those allegations has intensified, Trump has stepped up his tweeting about what he has called "Hillary Clinton crimes." And White House press secretary Sarah Sanders told reporters this week that investigators have been looking at the wrong issue as they probe a 2016 meeting involving Donald Trump Jr., Trump son-in-law Jared Kushner, then-Trump campaign chairman Paul Manafort and a lawyer who Trump Jr. had been told would have information from Russia that would damage the Clinton campaign. "If you want to talk further about a relationship with Russia, look no further than the Clintons, as we've said time and time again," Sanders said. The White House message is reverberating on Capitol Hill. Most of the Republicans on the House Judiciary Committee last week signed a letter asking Attorney General Jeff Sessions to name another special counsel — this one to investigate Clinton. The committee's Republicans are united in another bid for Justice Department documents on Clinton and a list of other former officials, including Obama Attorney General Loretta Lynch, former FBI Director James Comey and, as the committee put it, "possible Hillary Clinton co-conspirators." Rep. Matt Gaetz, R-Fla., said during the committee debate last week, "If it's in the public interest to investigate the Trump administration, it is most certainly in the public interest to investigate the real crimes by the real criminals." But the calls for law enforcement probes of a defeated candidate may be unprecedented. "I can't really think of any previous experience to compare it to," said Daniel Feller, a presidential historian at the University of Tennessee. As a specialist in Andrew Jackson's presidency, he knows a lot about partisan conflicts in American politics. It's rare to see candidates re-fighting an election, he said, but this is particularly odd because "it's the winners who want to re-fight it." Clark, the law professor, said of the calls for a Clinton investigation, "I think it puts the democracy at risk." She added, "It's improper to use the investigative authorities of the state as a raw political tool." She noted that President Richard Nixon tried to get the FBI and Internal Revenue Service to investigate his political rivals. The House Judiciary Committee put that abuse of power in the articles of impeachment against Nixon.